To celebrate St. Patrick's Day, Mrs. McNally and her students created authentic Irish soda bread. This lesson truly represents Practical Life and working together taught our class wonderful life skills. The children each had the opportunity to measure, pour, and stir as they take turns as with the dry and wet ingredients. 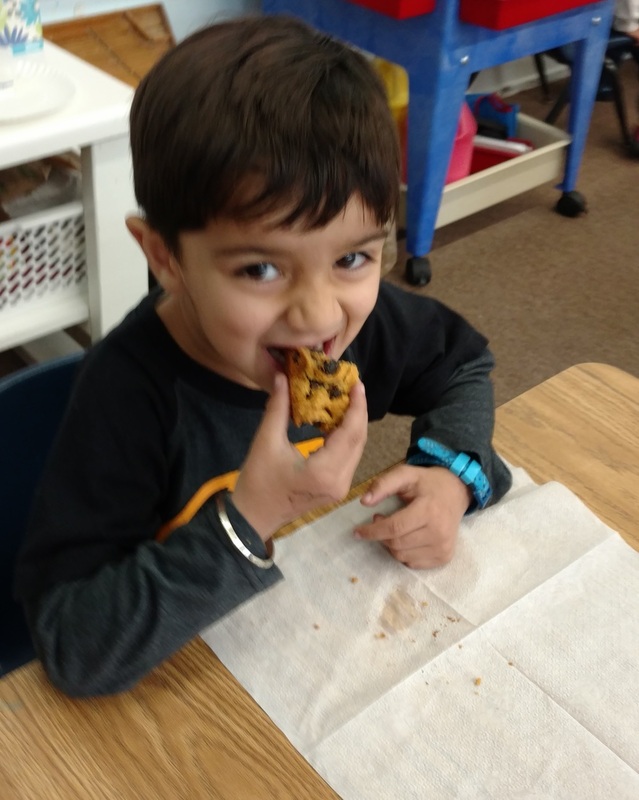 Our budding bakers inhaled their bread and "raved" to each other about how delicious it turned out – try the recipe below from home! Preheat oven to 400 degrees F (200 degrees C). Grease two baking sheets. Stir together the flour, baking soda, baking powder, salt, and sugar in a large bowl until evenly blended. Cut in the butter using a pastry blender, or your hands, until the mixture resembles coarse cornmeal. Stir in the raisins, currants, and caraway seeds, then make a well in the center and pour in the milk and vinegar. Stir with a spoon until the dry ingredients are moistened. Turn the dough out onto a well-floured work surface and knead gently 8 to 10 times. Divide the dough into two balls, and place onto the prepared baking sheets. Bake in preheated oven for 15 minutes, then reduce heat to 375 degrees F (190 degrees C), and bake until the top of the bread is golden brown, about 15 minutes more. Spring-ing into Art and Action!